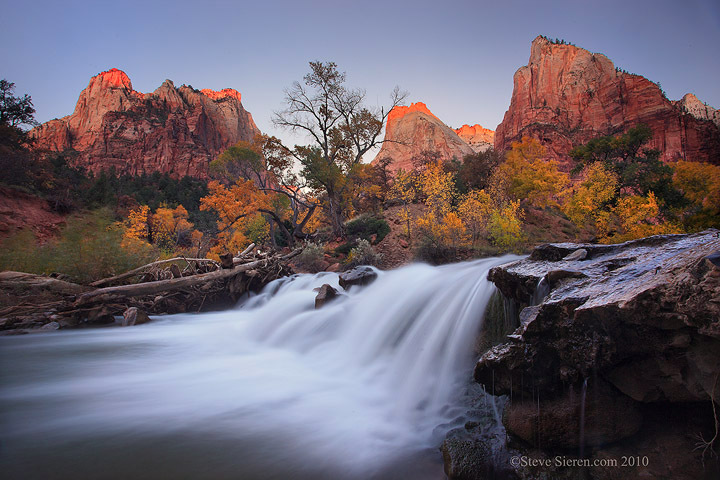 This image was taken the previous year at Zion. At this location it can be a little precarious getting down to the water’s edge so the average group will not be found here. It’s a man made waterfall despite it’s realistic look. I’d like to disclose that I cloned out part of a footbridge in the far right hand side. While I was processing this image, I found there were so many different white balances inside the frame. The blue sky at dawn had it’s own, the alpen glow had it’s own, the peaks were in between the the sky and the fall foliage, plus the waterfall had so much of a blue cast and the shadows in the far right corner were even cooler on the white balance scale. You may often see some guru talking about white balance and if you set it to an exact setting it fixes all your problems, I find that very hard to believe when many scenes have so many different white balances inside them so it helps but it’s not a fix all. A general setting will help but it’s highly likely you will need to make adjustments during your processing or blend multiple RAW files with different WB* settings. For this image I used Nik’s Color Efex Pro (sieren discount code). The brilliance & warmth slider made some of the white balance adjustments pretty easy and I masked them with a brush to keep the parts I wanted and discarded what I didn’t want to use. Also, I used the Remove Color Cast option for the “too blue” waterfall because the selective color adjustment in PS didn’t do enough. Although it still remains cool, it’s personal taste how warm or cool you may want something to be. Tonal Contrast was also used to bring mid tones to only specific areas I wanted them in. I thought I would share a few processing steps some people may have trouble with. This year there was a log jam from a flood here at this waterfall so I didn’t bother shooting it but found another little piece of Virgin River shoreline with a couple of golden cottonwoods that I hope to share later after I get back from the Joshua Tree Light Painting Workshop this weekend. *WB abbreviation for white balance. This entry was posted on November 10, 2011 at 12:41 pm and is filed under Uncategorized. You can follow any responses to this entry through the RSS 2.0 feed. You can leave a response, or trackback from your own site. i have this same dilemas on such many occasions… even a few days ago actually on an partial full moonrise image from malibu creek state park on friday afternoon. The sky surrounding the moon and the foreground green oak would not play nice together no matter what i tried to do with white balance. Just another reason why Photoshop for me is always the last process in my presentation of an image, no matter what tricks lightroom, DDP or Nikon Capture NX can do. Perhaps with one correct white balance and the perfectly adjusted color saturation slider position… i could achieve exactly what I saw that day. But, what fun would that be. I listen to the trees and they tell me…. they like Photoshop as much as super models and celebs… if not more. Nice post Steve. It’s true that sometimes one white balance doesn’t fit every part of the image. On the other hand, you don’t necessarily want neutral color balance everywhere either. I think you struck the right balance (pun intended, sort of…) between warm and cool hues here. Thank you Michael, I’m a big fan of warm and cool colors contrast even if they don’t appear as we would see them. I love the little bit of blue cast in shadows and waterfalls. This is an interesting post. I think Carr Clifton’s approach is similar to yours, but I cannot remember for sure. He also does a lot of feathering between various parts of the image. He creates what I believe are called reverse masks, he then paints them back in with a brush that is only a small percentage at a time. Isn’t it possible also to make masks of various areas and adjust the white balance in those places?